I again this week gained a pound. So 192. I am pretty sure it was due to yesterday (Saturday). Yesterday was one of those days where I never left the house…or my sweat pants. It was too easy to say “yes” when Cort suggested McDonald’s for lunch and then Taco Bell for dinner. I should be glad that only added one pound, yes? So today? I am munching a salad while I type this. Side note: The Halloween candy is gone. No more temptations there. Also, for anyone keeping track, I only have to teach 10 more night classes before I get my evenings back…and hopefully my booty gets on the treadmill and/or to the gym. I am WAY looking forward to this! I really, REALLY love teaching at the community college (actually wish that could be my “real” job), but it’s just taking too much time away from my family and my health. So I am taking next semester off. This week will be interesting for McFatty. I teach two night this week and I have Parent/Teacher Conferences the other two nights. I will either lose massive amounts of weight or gain it. It is also my “lady week”. So we would be looking at a trainwreck of a post next week. apparently Tony's pizzas were 4 for $10 today. Ugg. 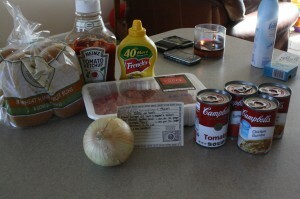 Tonight I will be making my mom’s BBQ recipe so that we can have that on buns all week for lunches and dinner. I use two pounds of burger, browned with salt, pepper, and a bit of chopped yellow onion. I serve on wheat buns. 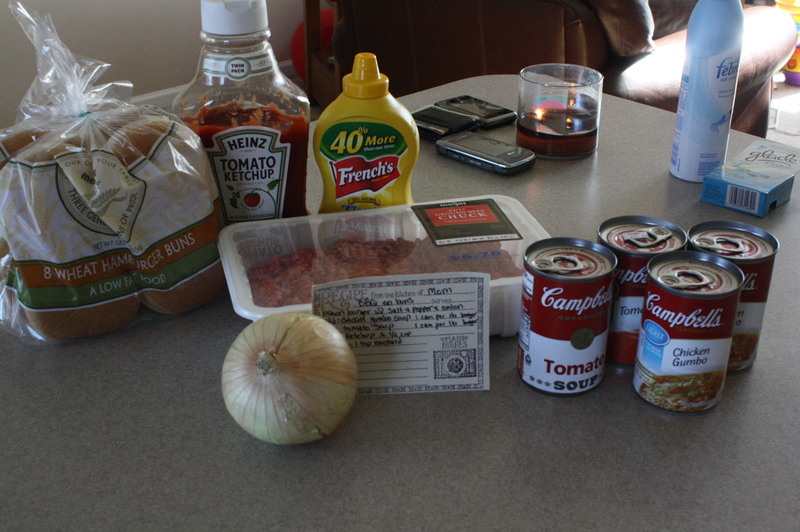 making this tonight for the whole week! 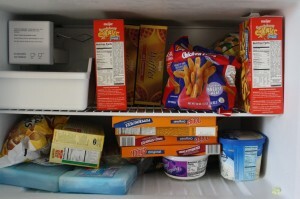 We also stocked the fridge with fresh fruit and the pantry with canned veggies that we rinse and serve to Eddie. Cortney bought the monster can of yams because that is the only veggie we know Eddie will eat every time it’s served to him. Weird? Probably. Anyway, we will see how this week goes. *Tomorrow is Top Ten Tuesdays! I will be making a list of the Top Ten Things that are necessities to me each day. Won’t you join in? **Also coming to Sluiter Nation are sponsor highlights…just in time for your holiday shopping! If you are interested in ad space, I have a few spots available…just in time for the holidays! Email me at sluiternation (@) gmail (dot) com for more information! If you are into punctuation and the art of editing your writing? I am getting all English teachery over at The Red Dress Club today. Take a read. First of all, I am not unaware of the hullabaloo this article has created all over the internet. It makes me crabby that someone cares more about overweight people kissing on TV than the fact that they have everyone constantly making fat jokes about it all. Something is wrong there, people. Where were all these grossed out people when Rosanne was getting frisky with Dan 20 years ago? Oh wait, people liked it because it was REAL. Anyway, I am a REAL person and I am overweight at 191 pounds (yes, I went up a pound. I blame the Halloween candy). I am 5’7″ (roughly) and 191 pounds. That is way overweight. And you know what? To my knowledge? No one has ever gagged or thrown up in their mouth when Cort and I smootch on each other. I mean, if I have ever offended someone by holding my husband’s hand or kissing him, well, then…TOO BAD! My point is that people who crab about fat people? Need to shut up. That is my McFatty lecture for the day. There is more that I could add, but really? I don’t think it needs to be said. Publicly bashing fat people for grossing you out? is hurtful. Just don’t look. This used to be full. 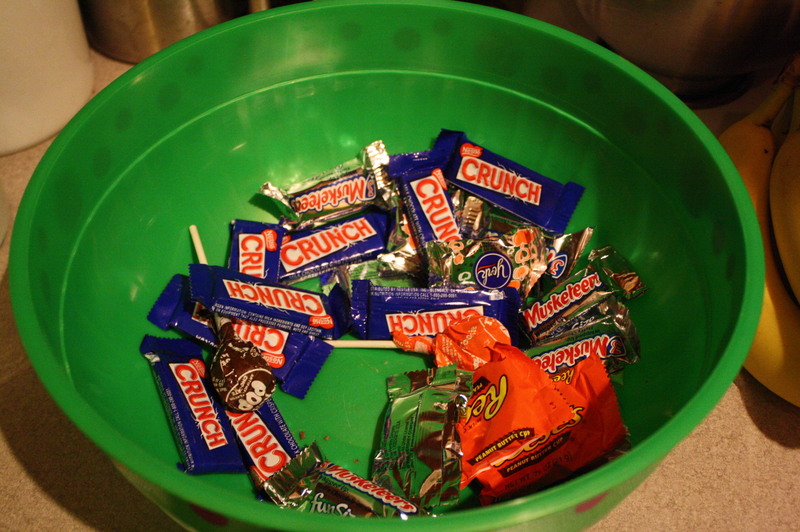 And we only had like 6 trick or treaters. oops. I am not even going to post on here in all of public how many bags of candy we went through..BY. OURSELVES. 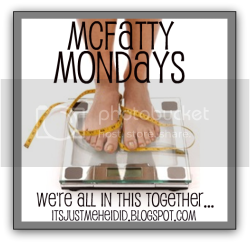 And I am just thanking my McFatty stars that i only gained a pound. Anyway, this week while I was battling with myself not to eat yet another “fun sized” treat, my friend “The Rocky Mountain Mama” informed me that she does a Meal Planning Monday. I thought this fit pretty well with McFatty Monday since besides telling you all what I weigh, I am struggling to make better food choices. 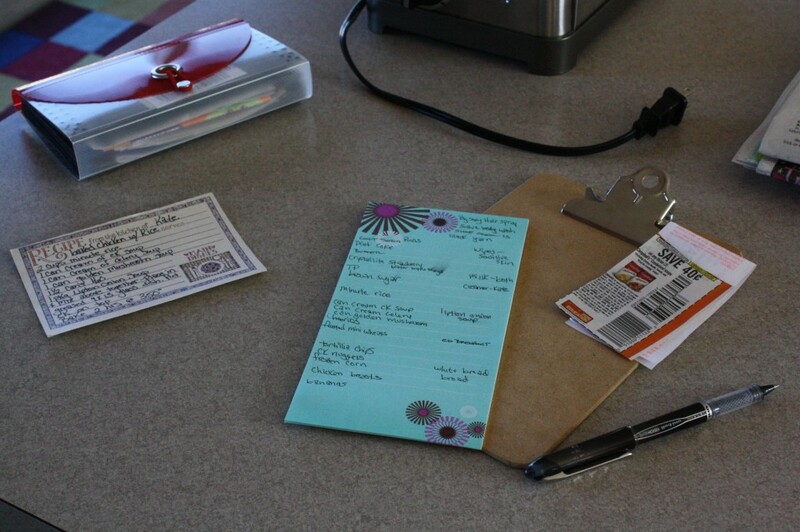 For us, meal-planning starts on Sunday–before Cort goes and gets the groceries for the week. First we decide together what would be a yummy meal for Tuesday night–the one night a week we get to eat as a family. This week we decided on baked chicken with rice (recipe to follow). Then I make the list and dig through my coupon holder to match up with what we are buying. Before finalizing the list, I flip through the Meijer sales flier for the week to see if they have anything listed on sale that we could stock up on or use in lunches. After all that, I add anything else we need in the house like TP or dish soap. 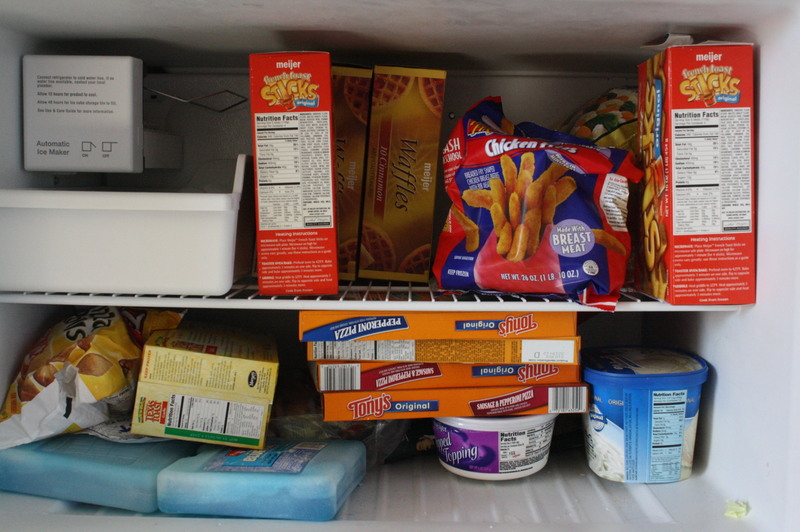 Lastly we think about what we will eat on the nights we are apart. I usually eat PB sandwiches on wheat bread. And that is it. Cort takes a look at the list to make sure he knows what I am talking about, then he gathers up the Meijer reusable bags and the coupons and he is gone for an hour. I like this recipe because we will have leftovers that I can take in my lunch. We also usually have a veggie of some sort with this. This week we are having corn. So there you have it! Hopefully I can make better choices now that the candy is almost gone from our house! Also? Tomorrow is Top Ten Tuesdays here in Sluiter Nation. We are listing our Top Ten Favorite Children’s Books! Join in!